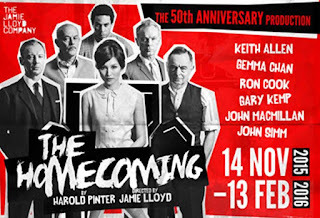 Last Saturday night Stuart and I went to see Jamie Lloyd's production of The Homecoming at the Trafalgar Studios in London's glitzy West End. 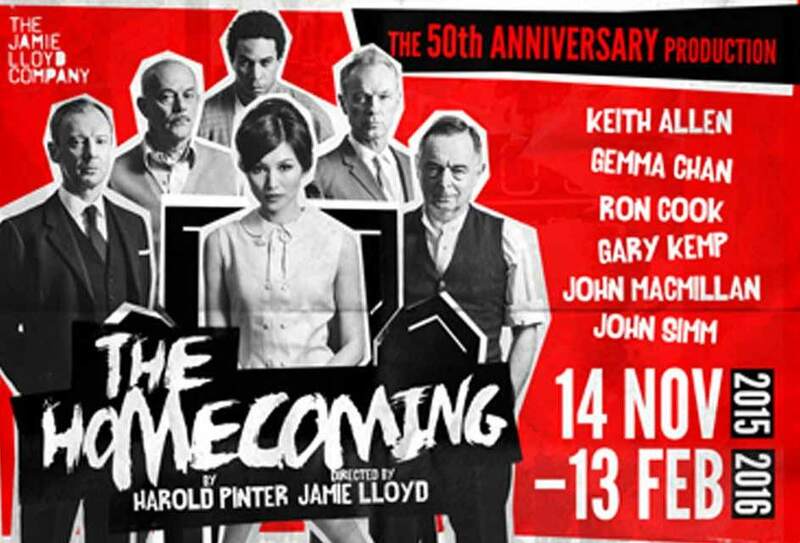 John Simm, Gemma Chan and Keith Allen star in this chilling 50th anniversary revival of Harold Pinter's masterful play. The action centres around bullying, foul-mouthed father Max (wonderfully played by Ron Cook) and his all-male family. Max is a retired butcher and he treats his three sons, brother and new daughter-in-law like objects, like meat on a slab. With the arrival home of his eldest son Teddy (played by Spandau Ballet's very own Gary Kemp) and his doll-like wife Ruth (played enigmatically by Gemma Chan) old tensions come to the fore and the family's dysfunctionality is soon on show. John Simm's malevolence as the middle son Lenny is genuinely unsettling and John Macmillan as youngest son Joe is always threatening violence. Uncle Sam played rather camply by Keith Allen does at least provide some light relief as Pinter racks up the tension to boiling point. What on the face of it seems like a straight-forward play about a homecoming soon is exposed to be about much more. It is a play about control, about lose, about the absence of women, about love and hate, about resentment and in the battle of wills in families and when you hunt for power - just who is the predator and who is the prey? Great play. Great cast. Good production.